Anyway, the 2013 Audi S4 that I got the keys for the weekend was a well optioned Premium Plus, which included: MMI Navigation plus package, Bang & Olufsen Sound System, 19-inch five tri-spoke wheels, Audi advanced key and Carbon Atlas inlays. Add in the upcharge for the pearl effect paint, Nappa leather, all-weather floor mats, wheel lock kit and the “Supercharged” badges (replacing the consumer confusing “V6T” badges) brought the sticker price to $57,750 with destination charge. The 2013 Audi S4, along with all of its B8 platform mates, receives a completely new face (angular Single Frame Grille, more aggressive lower front fascia and new headlights with the new LED DRL light pipes) and some updated interior tweaks. If you opt to go with the updated MMI Navigation plus package with Audi Connect and Google Earth, the center console controls are now simplified compared to previous model years. It seems that the backup camera that comes with the package with the updated MMI Navigation plus package puts out a higher resolution when compared to the one that comes in my 2011 Audi S5. Outside of the new MMI system, the biggest change that I really like is the new flat-bottomed steering wheel; particularly, I like how much thicker the rim of the steering wheel is. Compared to the steering wheel in my 2011 S5, the new wheel feels better in hand and makes quick maneuvering a wee bit easier. The black with red leather seat inserts match the Misano Red paint perfectly; but, I still prefer the Alcantara seat inserts as they provide a bit more grip when negotiating the twisty mountain roads up by Oregon wine country. What you will notice is that one of my must-have options for an S model isn’t on that list and it is something that I noticed pretty darn quickly: the car wasn’t optioned with the Sports Differential. The first time I took a turn at a brisk speed, I noticed a bit more understeer than I would normally get in my S5 with the Sports Differential. At a stop light, I checked the MMI menus and noticed that there weren’t any of the Audi drive select options for steering or engine. 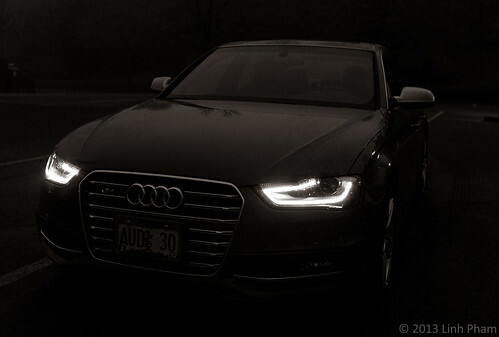 That kind of tempered my feelings for the S4 a little bit, but not enough to still have fun with the car. One of the characteristics that the combination of the supercharged 3.0-litre V6 and the S Tronic dual-clutch gearbox, that is common among the S4, S5 cabriolet and now the 2013 S5 coupé, is the sound when shifting gears at high RPMs. The sound is commonly called a “fart”. Between the “fart” and the seemingly louder engine/exhaust sound when compared to my S5’s V8, it slightly adds to the boy-racer feel to the sporty sedan. I do have to say that I am pretty sensitive to engine and exhaust droning (excessive droning can cause me to have severe headaches, light vertigo and really bad case of nausea), and I did sense a bit more drone that I would have liked when hovering north of 3500 RPM. Having experienced a 2013 S5 coupé with the same engine and gearbox combination last July, I got the taste of the more accessible torque and lightning quick shifts. 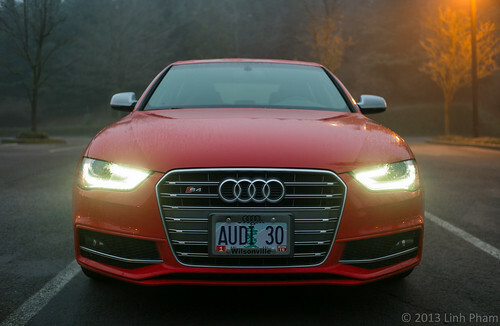 Driving the S4 around that weekend was no different and could have led me into more trouble if I didn’t restrain myself. Although I did not try launch control in the S4, but laying down on the accelerator when the light turned green gave me an idea of how much grunt the supercharged engine has. For most of the weekend, I either kept the gearbox in S or in M and used the flappy paddles to change gears. As with almost any other automatic or automated gearbox out there, leaving it in normal D mode lead to the gearbox to go into 6th or 7th gear as quickly as it could. There were a couple of times where there was a bit longer of a delay in upshifts and downshifts; but, not as bad as it is in the older 5-speed Tiptronic gearboxes. According to the EPA fuel economy ratings, the 2013 S4 with S Tronic is rated 18 MPG city, 28 MPG highway and a combined rating of 21 MPG. I can safely say that with how I drove all weekend, I did not get 28 MPG on the highway and sometimes saw averages closer to 15 to 16 MPG. The trek down and back up from Salem and Albany netted an average of around 18 MPG, and that included some freeway, rural roads and putting around downtown Salem. I’m sure if I left the gearbox in normal D mode and did not try to make the car “fart” as many times, I could have gotten a better average. Then again, where’s the fun in that, particularly when driving an Audi S model? After a weekend with the refreshed Audi S4, even one without the Sports Differential, it was a bit hard to hand back the keys to the car… okay, maybe not as hard as having to hand back the keys to an Audi R8 V10. 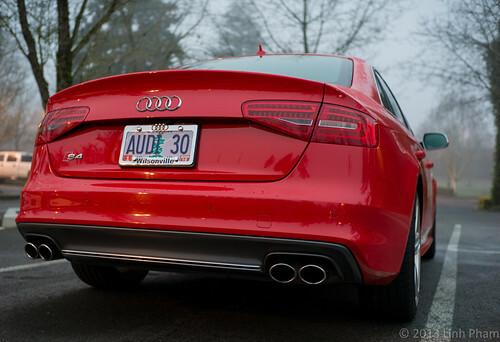 I enjoyed the how nimble the car can be with the supercharged V6 and the rear-biased quattro. If I were to choose one to call my own, I would get the manual gearbox, add the Sports Differential, order it in Audi Exclusive Sprint Blue (shocking, no?) and swap the seats for the ones in Black leather and Lunar Silver Alcantara inserts. With the 2013 S5 coupé getting the same drivetrain combinations as the 2013 S4, it makes comparing the two more apples-to-apples than before. Do you need usable backseats and the two extra doors, or do you prefer the sumptuous looks of the coupé? There is also the couple thousand dollar premium that the S5 has over the S4. For me, I don’t need the two extra doors, rarely have people occupying the backseats and can’t stop staring at any and all A5/S5 coupés that cross my path. Now, if only Audi would bring over the S4 Avant to the US, then all bets are off. 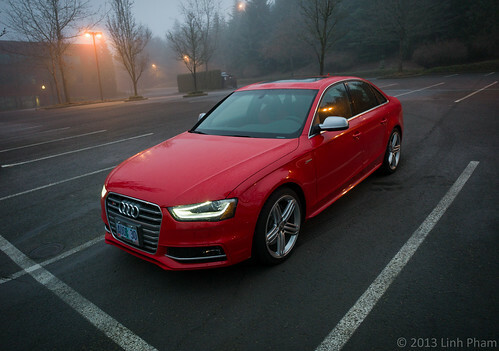 I would like to thank Scott Mitchell and Audi Wilsonville for providing me with the loaner S4 for the weekend. For additional photos, please check out the “19 Jan 2013 Misano Red Audi S4” set posted on my Flickr photostream.